In Champagny-en-Vanoise, summer and winter alike it is vibrant with all its attractions. For our new luxury residence "Les Balcons Étoilés" we have selected one of the most beautiful plots in the resort. Find out all about the advantages of purchasing Champagny-en-Vanoise apartments with MGM. It is rare to find such a perfect resort. Champagny en Vanoise links with La Plagne, Les Arcs, Peisey-Vallandry, VillaRoger, Montchavin, Les Coches, Montalbert forming the immense Paradiski, one of the most impressive ski areas in Europe.An extraordinary skier’s paradise made possible by the "Vanoise Express", the largest cable car in the world. 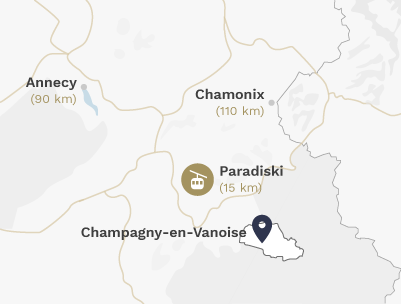 From the centre of Champagny en Vanoise, you can easily access the entire ski area and other neighbouring resorts. The whole winter, there is a rich program of spectacles and activities of all sorts creating a convivial and authentic atmosphere (tradition, sports, culture, relaxation, party...). In Champagny La Plagne, the gateway to the Vanoise national park, MGM has decided to develop its new stunning residence, "Les Balcons Étoilés". Cosmopolitan, sporting and innovative, Tignes can offer you the unique experience of a different way of living in the mountains.